The new "Celebrity Apprentice" host is campaigning against the old "Celebrity Apprentice" host. GOP presidential candidate John Kasich announced on Thursday that he would be holding a campaign rally on March 6 with Arnold Schwarzenegger, the former governor of California and the new host of NBC's "Celebrity Apprentice." The news came moments after the former "Celebrity Apprentice" host, Donald Trump, spoke of Schwarzenegger during a campaign speech in Maine. Trump said NBC and Comcast CEO Stephen Burke asked him to do another season of "The Apprentice" instead of running for president, and got on the subject of his replacement, Schwarzenegger. "How will Arnold do, by the way?" Trump asked the crowd. "Who would be better? Arnold or Trump?" The crowd was silent when he asked, "Arnold?" and cheered when he asked, "Trump?" "Well, we're going to find out if Arnold is quick because if he's not quick he's not going to look good," Trump continued. "When you got Omarosa and all the other ones coming at you, you got to be quick. You got to be smart." 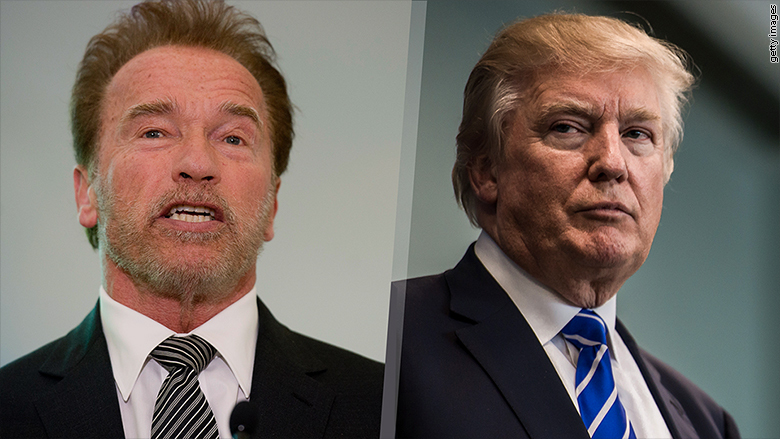 Trump ended his comments about Schwarzenegger saying, "We'll find out, we're going to learn a lot about Arnold. I hope he does well." This isn't the first time that Schwarzenegger has spoken at a Kasich event. The former action movie star spoke at a Los Angeles fundraiser for the Ohio politician. Schwarzenegger was named the next host of NBC's "Celebrity Apprentice" in September.